I. Introduction: There are many species of cutworms that are found on many different crops. Several species, known as the climbing cutworms, tend to climb fruit trees in spring and feed on the buds. The large larvae cause similar kinds of injury to fruit and ornamental trees and the robust adult moths of each species are similar in appearance to each other. At least 10 species of climbing cutworms cause damage to fruit trees in the eastern U.S. and Canada, but the six species listed above are the most common and widely distributed. Climbing cutworms are sporadic pests that are mainly serious problem of young orchards, especially with sandy soils, where they may completely strip the foliage and buds in the spring. II. Hosts: Climbing cutworms can be found on apple, peach, pear, and plum and grape are economically important hosts. Ash, boxelder, birch, boxelder, maple and other species are also fed upon. III. Description: The larvae of climbing cutworms are large, smooth caterpillars, measuring 1.2 to 1.6 inches (30 to 40 mm) when fully grown (Plate 71). The body has only a few hairs and the head capsule is usually brown or black; some have unusual markings on the head. Larvae of the different species vary in color with most species having a dull gray-brown background color with various species having stripes, spots, or marked with dark brown, black, yellow and white splotches. 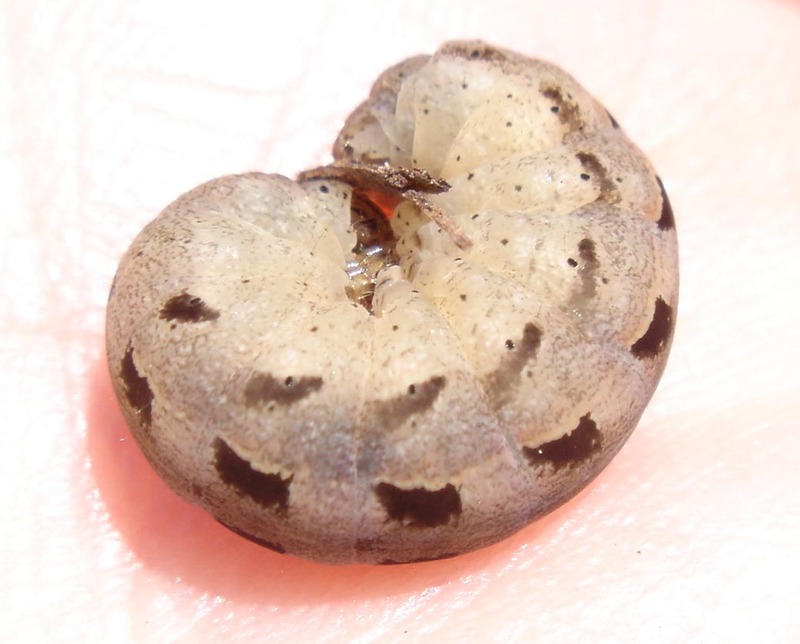 The dark brown pupae resemble those of leafrollers, but are much larger in size [i.e. >0.8 inch (20 mm)]. The adults are dark brown or grayish colored moths that look quite similar and have wingspans of about an inch (25 mm). IV. Biology: The biology of the various climbing cutworms varies considerably but the peak flight periods and generations for some of the common species are listed above. The most common species have one or two generations per year and overwinter as half-grown larvae on the soil in leaf litter and orchard debris. A few other species overwinter as eggs or even as adults. The species which overwinter as larvae begin to become active as the weather warms, generally in mid-April. This group of moths derives its name from the larval habit of climbing trees to feed on buds and young foliage during the night, and then crawling back down to the ground to seek shelter under leaf litter or debris on the orchard floor during the day. The larvae often curl up tightly when disturbed. Hundreds of larvae may feed on a single tree. The larvae mature by May and enter the soil to construct pupal chambers. In two-generation species, second generation feeding is minor. Adult emergence varies among species as shown above, but the most common species are on the wing from June through September. Eggs are laid on leaves, twigs, bark or even grasses. Newly hatched larvae of the single generation species seek low vegetation on which to feed until fall when they move to the ground seeking overwintering sites. Species with multiple generations per year generally overwinter as eggs. V. Injury: Most injury from climbing cutworms occurs in the spring when they feed on fruit buds or blossoms. The larvae generally feed only on the lower central portion of the tree around the trunk, but under high population pressure, complete limbs or even whole trees may be stripped. Small trees are the most severely affected and abnormal growth can result from heavy defoliation several years in a row. Feeding by cutworms on the foliage or fruit during the fall or summer is rare, but may occur when the variegated cutworm is present. VI. Monitoring: The best way to monitor is to check buds in the lower center of young trees for signs of first feeding early in the spring and to check the leaf litter around the base of the tree for overwintering larvae. Examine sites on the ground for rolled up larvae (under clods of earth, etc.). The larvae can only be observed feeding in the trees at night. Black light traps readily capture the adults, but because of the many host plant species and similar looking nonpest species, it is usually not an effective way to monitor. Because of the sporadic nature of this pest complex, thresholds have not been established. Small trees are harmed the most by heavy defoliation, but large trees can withstand even several successive years of heavy defoliation in spring.